New Orleans Magic is a 23 inch all porcelain doll. The body is designed by Ali Hansen of Childhood Fantasies and the head is Caterina by Audrey Hamann. Her head is fully poseable and her arms are jointed at the shoulders and legs jointed at the hips. She has been interpreted as a Mardi Gras figure and has a costume consisting of a hand painted body suit of silver white China paint accented by "fired-on platinum" at the wrists and a ring on her left hand. There are garlands of hand painted roses and vines on her legs and on her feet are hand made shoes of lace and pink flowers with white glittered heels. She wears a handmade skullcap covered in white glitter, pink and yellow roses and silver leaves with a lavish embellishment of white coque feathers surrounding her face. A narrow ribbon belt with beaded garland, roses and ribbon and pearl streamers is about her hips and a full pink tulle drape falls in back also with pearl and ribbon streamers. Additional roses accent her neckline. 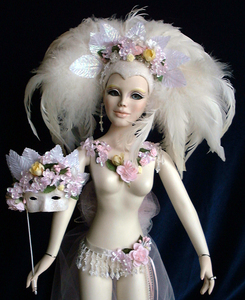 She carries a handmade white mask in her right hand also decorated with shimmering leaves and roses. Magic’s face is painted in soft delicate colors with fantasy colors about her eyes which are a lovely color of pale blue from the Eyeco silicone eye line. She comes with a mirrored display stand with a rod that goes up inside one leg for invisible support. 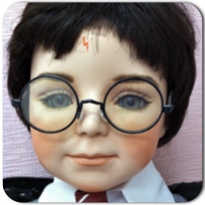 This is a one of a kind doll, requiring 14 China paint firings to achieve her skin tones and decorative designs. 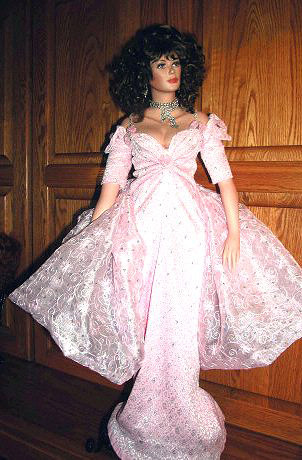 $370.00 with FREE SHIPPING included with this doll to the domestic USA (excluding Alaska and Hawaii). Box sent by UPS Ground. Layaway available with one third down and remainder within 90 days. $370.00 Ships within 24 hours.